I have some photos to share today! It’s been a while since i’ve gotten proper pictures of a costume, so I’m excited about these. 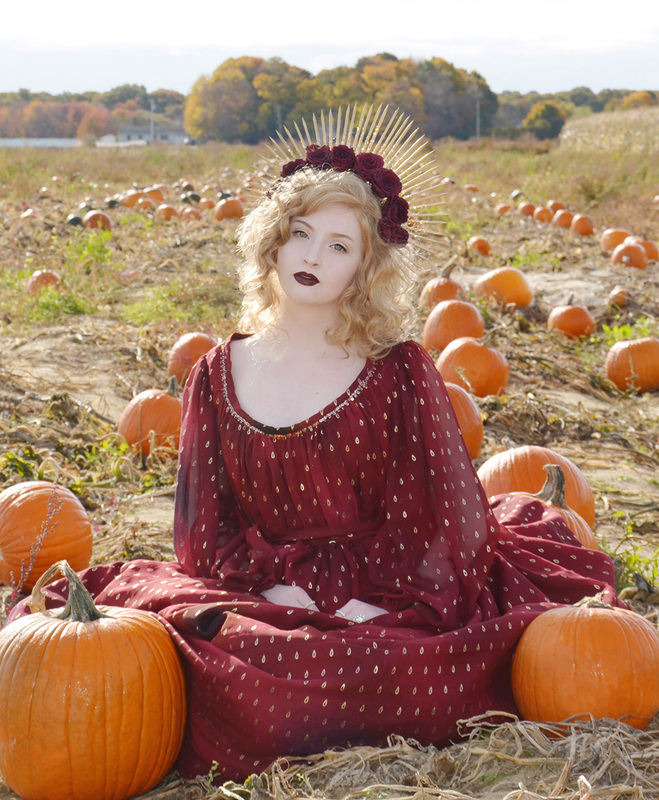 These photos were taken in a pumpkin patch and in front of a corn maze that a local farm had set up. I took pictures in one last year but didn’t plan on doing it again this year since I didn’t feel any of my costumes were appropriate for the location. But when we passed by this one I changed my mind. 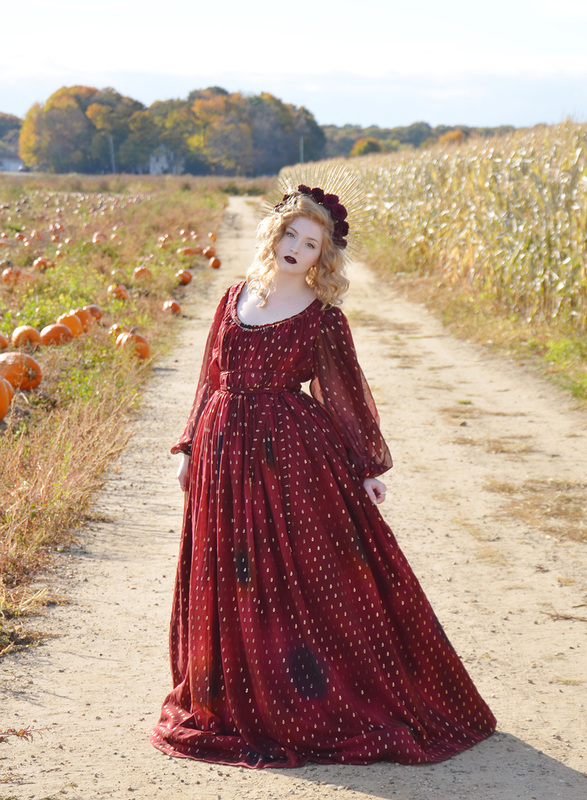 Something about the color of the corn and the reds of changing trees reminded me of my Heinrich Dress. So my dad and I got up early on a Saturday and drove out to the farm to get some pictures! It was kind of a frustrating shoot because the camera seemed determined to focus on the corn instead of me, and things looked overexposed no matter how much I fiddled with the settings. But things turned out okay! I ended up with a few shots I really love, and a half dozen more that i’m also happy with. I think the costume has a Harvest Princess kind of vibe to it in this setting, which I really like. More information about this dress can be found here. I was either squinting or had my eyes closed in most of these because it was so sunny, but I’ve tried to pick the ones where it looks intentional. Fun fact about these photos: I was barefoot in all of them because I thought the skirt looked better that way! That’s it! Thanks for reading! A ‘Making of’ post will be up later in the week. Wow. Just wow.This is amazing. And you look like you could be a model! You have done such an amazing job. The pictures are beautiful! You are such an inspiration. I think this dress is dreamy. Good choice for site. It does seem to fit/ I think it would do equally well in a mossy forest. Was it cold? The sheer sleeves wouldn’t be suitable for the cold, but the rest of the fabrics would probably give a decent layer of protection. You are so talented and beautiful, your parents are so lucky to have a daughter like you. This is truly breathtaking! If you don’t mind me asking though, what lipstick are you wearing here?